This is a great project. We do up a great dripping background, then we use a stencil to sketch out the proper proportions of the cow. This done we use acrylic paint to make a charcoal style portrait of a cow. I was commissioned to paint 50m of Boundary street in West End, and as a subject matter I chose to paint a herd of cattle; It was an uncertain time, a time of change, and I thought that if a herd of cows didn’t calm things down, then nothing would. I was, as it turned out, quite wrong; cows didn’t calm down those that were agitated, so I painted a 10m long crocodile. That didn’t work either. Still, the cow is very calming! Take stock of the colours you use in your home and pick colours that complement. 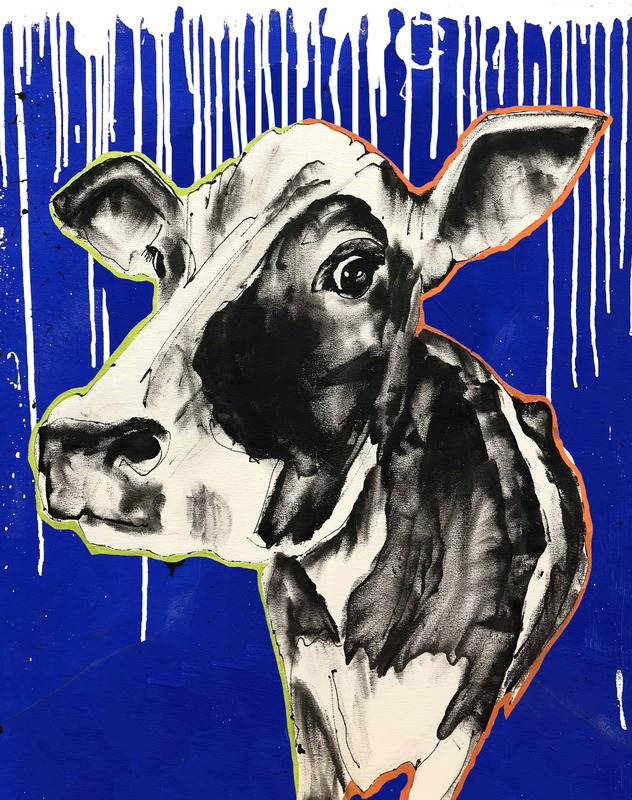 A one off original stencil image of the best cow in the world, painted on a 600x760mm double thick canvas in colours of your choosing. Don’t forget to arrive early; handover your BYO to be put on ice and you will receive a complimentary glass of sparkling downstairs in the bar.